The BCA Shaxe Tech shovel/ice axe combo is ideal for ski mountaineering, as it saves weight and space in your pack by eliminating the redundant shaft when carrying a separate ice axe. 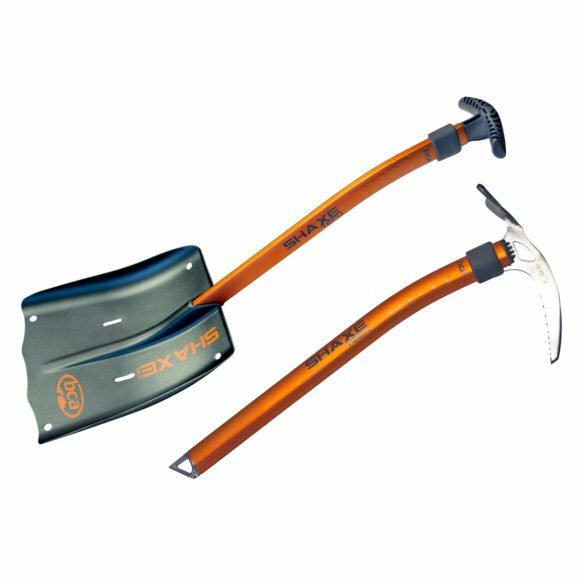 The BCA Shaxe Tech avalanche rescue shovel comes with an interchangeable ice axe head for Type 1 (basic) ice axes. The Shaxe Tech has a curved fixed-length shaft and stainless steel head with additional 9 degrees of pick angle providing higher performance on harder, steeper climbs. Great addition to your spring/summer skiing arsenal. Shovel still operational when switched to axe mode. Includes hardware to utilize the blade and shaft to make a rescue sled with K2 skis (or any skis with holes in tip and tail). The smooth blade allows for shaving down clean snow pit walls and contains holes for use as a snow anchor.